EU Commission latest report on real economic convergence in the EU10 Accession states of Eastern and Central Europe (CEE10) sounds like a cheerful reading on successes of the EU and the Euro. The report overall claims significant gains in real economic convergence between the group of less developed economies post-joining the EU and the more advanced economies of the EU. However, there are some seriously pesky issues arising in the data covered. Firstly, consider the sources of convergence (growth) over the period 2004-2014. 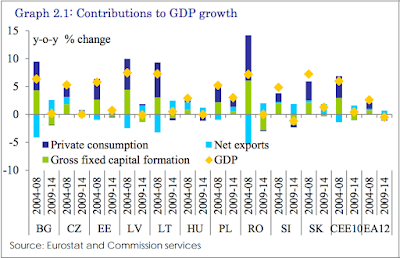 As chart above shows, in 2004-2008 pre-crisis period, Private Consumption posted significant contributions to growth in all EU10 economies )Central and Eastern European economies of EU12 group). This contribution became negative in 6 out of 10 economies in the period 2009-2014. It fell to zero in 2 out of 10 and was negligibly small in another one. 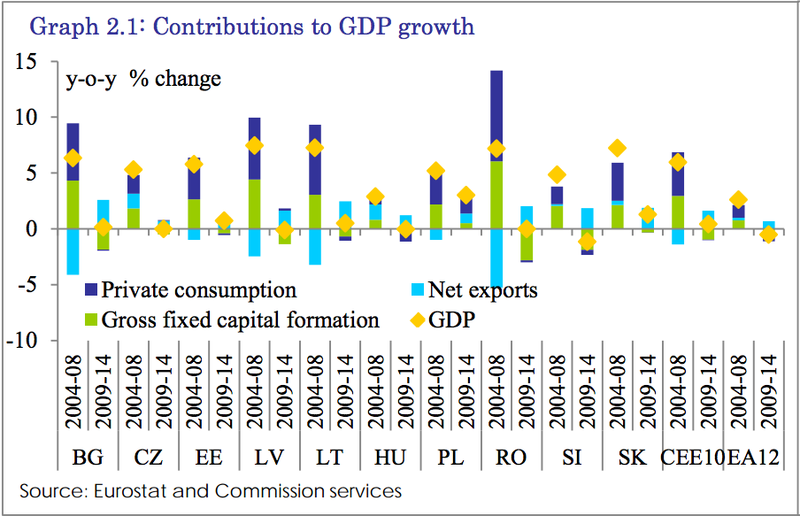 Poland was the only CEE10 economy where over 2009-2014 contribution of personal consumption was positive and significant, albeit it shrunk in magnitude to about 40% of the pre-crisis contribution. Likewise, Gross Fixed Capital Formation (aka investment) contribution to growth also fell over the 2009-2014 period. 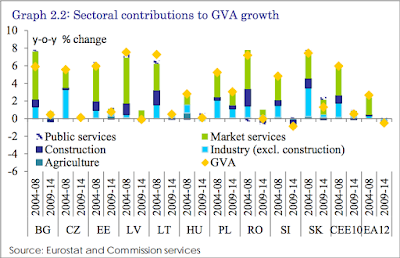 In 2004-2008, investment made positive and significant contribution to growth in all CEE10 economies. Over 2009-2014, Investment contribution was negative for 7 out of 10 economies and it was negligible (near zero) for the remaining 3 economies. Thus, about the only significant factor driving growth in 2009-2014 period was net exports - the factor that does not appear to be associated with investment growth. As the result, overall growth rates have fallen precipitously across the region in 2009-2014 period compared to 2004-2008 period. 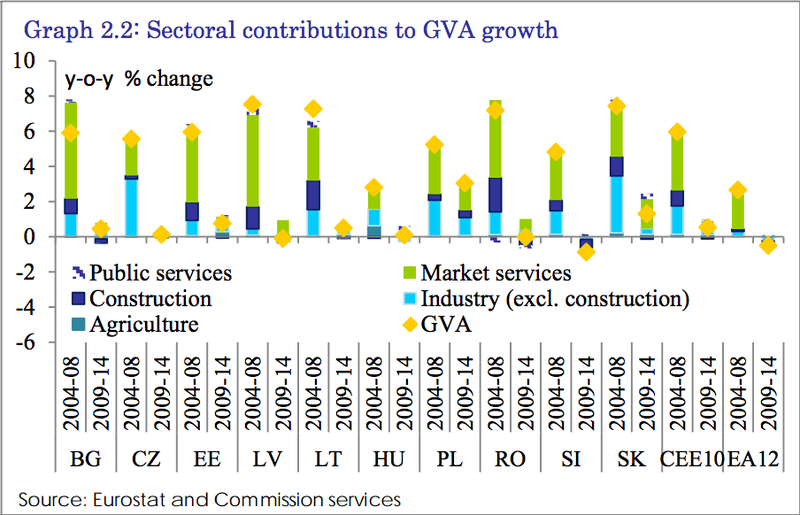 Gross value added across all main sectors of the economy literally collapsed over the 2009-2014 period across all CEE10 economies, with only Poland posting somewhat decent performance in that period compared to 2004-2008. One thing to note here is that even during the robust growth period of 2004-2008, Agriculture - a significant sector for a number of CEE10 economies was largely insignificant as a driver for gross value added in all but one economy - Hungary, where agricultural activity strength in overall economic activity traces back to the socialist times (1970s reforms). Market services activity registered robust growth in 2004-2008 across the region predominantly on foot of major expansion of financial services. 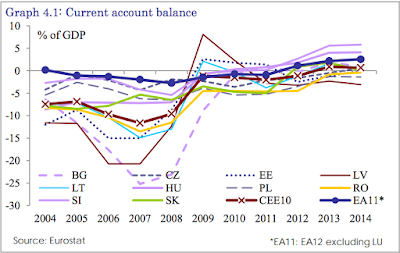 Adding farce of a comment to the real injury of the above data, per EU Commission report: "As a result of relatively higher GDP growth rates, CEE10 countries achieved significant real convergence vis-à-vis the EA12 between 2004 and 2014. The CEE10 average GDP per capita level in purchasing power standards (PPS) increased from about 50% of the EA12 level in 2004 to above 58% in 2008. After having declined somewhat in 2009, it increased gradually to some 64% of the EA12 level in 2014." 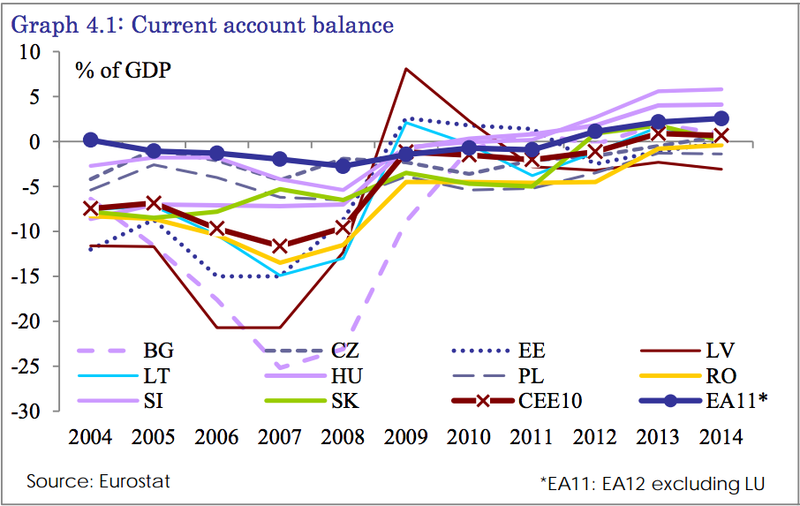 Much of this convergence is really due to the decline in GDP in the rest of the EU, rather than to growth in GDP in the CEE10. Not that the EU Commsision would note as much. "However, there was a considerable cross-country variation with the pace of convergence in general inversely related to initial income levels. Considering the three most developed CEE10 economies in 2004, Slovenia has not enjoyed any real convergence, while the catch-up was also relatively limited in the Czech Republic and Hungary (as also pointed out by e.g. Dabrowski (2014)). On the other hand, relative GDP per capita levels in PPS increased by about 20 percentage points in Baltic countries, Poland, Romania and Slovakia. Nevertheless, Bulgaria, which started with the second lowest GDP per capital level in 2004, also only achieved a below-average pace of convergence of some 11 percentage points." In simple terms, the above means that the core drivers for any convergence would have been down to reputational and capital markets effects of accession, rather than to real investment in future capacity, skills and knowledge. Building roads, using Structural Funds, and getting Western Banks to lend for mortgages seems to be more important in the 'convergence' story than creating new enterprises and investing in real jobs. As the EU notes: "The rapid pace of economic convergence in the pre-crisis period partly reflected an investment boom. The average share of gross fixed capital formation (GFCF) in the CEE10 increased from below 25% of GDP in 2004 to above 29% of GDP in 2007 and 2008 while it remained below 24% of GDP in the EA12. This investment boom was stimulated by optimistic growth expectations and supported by external funding availability. …Although on average roughly half of GFCF consisted of construction both in the CEE10 and the EA12, housing accounted for only about fourth of construction activity in the CEE10, compared to more than 50% in the EA12. This could be interpreted as overall indicating a more productive investment mix in the CEE10 in the run-up to the 2008/09 global financial crisis." Or it can be interpreted as heavier reliance on EU Structural Funds and Convergence Programmes that pumped money into roads and public infrastructure construction. Which may be productive or may be irrelevant to future capacity, as all of us can see driving on shining new roundabouts in the middle of nowhere, Ireland. 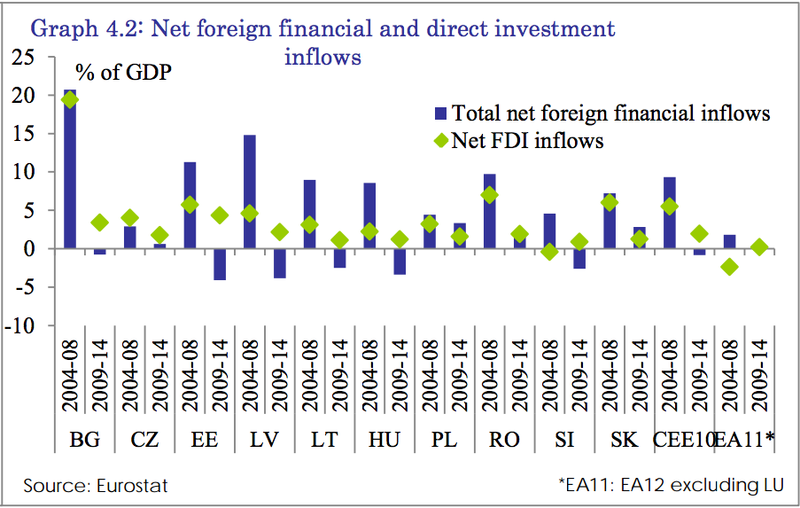 Meanwhile, FDI collapsed across all countries, ex-Slovenia (where FDI figure for 2009-2014 is distorted to the upside by banking sector flows). 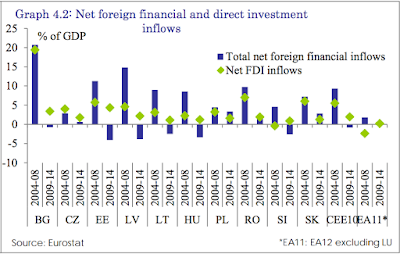 As EU notes: "Although net FDI inflows remained positive in all CEE10 countries they on average amounted to some 2% of GDP in 2009-14 (after having exceeded 5% of GDP in 2004-08)." All together, the picture of economic convergence is there, but it is more characterised by convergence via financialisation and transfers (both public and private) than by organic growth. This conclusion is equally pronounced before and during the crisis period. Much of the 2004-2008 period convergence was driven by private debt accumulation and 2009-2014 period convergence was primarily driven by adverse growth environment in the rest of the EU, plus public debt accumulation. Note: I will be blogging on debt issues in the next post, so stay tuned. You can access full report here: http://ec.europa.eu/economy_finance/publications/eedp/pdf/dp001_en.pdf.